Learn to use freeware to clone EFI partition to SSD or another hard drive within a few simple steps for another layer of protection. Why do you need to clone EFI partition? EFI system partition is a small partition formatted with FAT32 on a boot hard drive that is initialized as GPT (GUID partition table) partition style. As you know, GPT disks have many advantages over MBR disks. Most of the recent computers, if not all, boot from a GPT drive. Windows boot files are stored in EFI partition. If you delete the EFI partition by mistake or it is corrupted, Windows will fail to boot. That is why it is hidden and you cannot delete it with Windows running. If you open Disk Management, you can see the EFI partition at the beginning of the hard drive. As it is so crucial for booting Windows, you should have a backup of the EFI partition. Since the EFI partition will remain the same after several Windows 10/8/7 updates, you can just create a clone of the EFI system partition. What do you need for cloning EFI system partition? Some unallocated space or a partition. Be aware that all data on the partition you use to receive the clone will be deleted. You can clone the EFI partition to another hard drive or another partition on the same disk. If you need to clone it to another hard drive, you need cables or adapter to connect the second drive. To make the clone, you also need hard drive cloning software that is able to clone hidden partition. You do not need to pay for it. A free tool AOMEI Backupper Standard is good enough for cloning partitions and hard drives. If you have cloned a hard drive, but skip EFI partition, then you can also use this freeware to clone it over. 1. Download and run this free cloning software. 2. 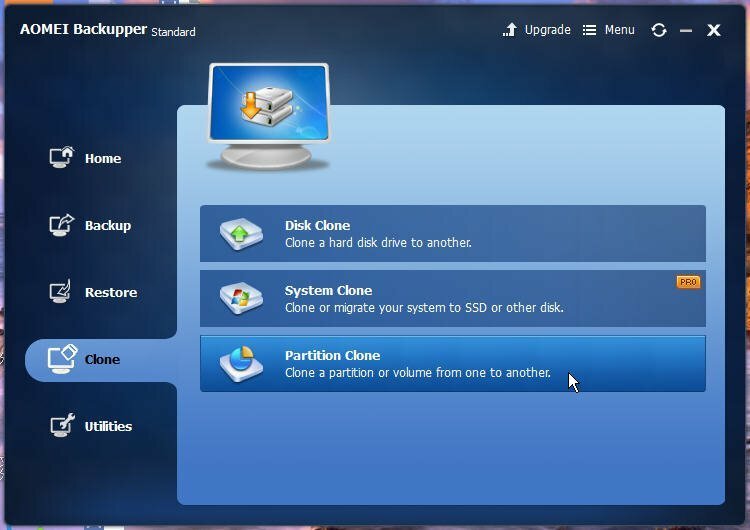 In the Home screen, click “Clone” and select “Partition Clone”. If you want to clone disk including EFI partition, you can use “Disk Clone”. 3. click on the EFI system partition to select it as the source. 4. Select a partition or unallocated space by clicking it as the destination location to save the EFI partition. 5. Click “Start Clone” to start the EFI partition clone. Since the EFI partition is about 100MB in size, the clone will be done in no time. Besides using this free tool to clone EFI partition, you can also use it to backup the EFI system partition into an image backup file to have another extra layer of protection.